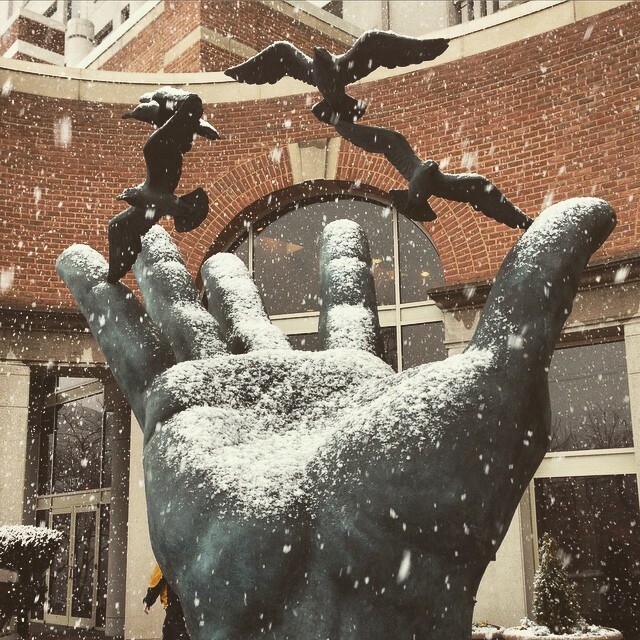 The Hand of Noah in front of NOAA Building Three. The National Oceanographic and Atmospheric Administration (NOAA) is a large federal bureaucracy in Silver Spring, MD. I’ve worked there as a contractor in two separate stints – three years in the National Ocean Service (NOS) and a little more than two years (so far) in the National Weather Service (NWS). If you work at NOAA, you refer to where you work by building number. In NOS, I worked in Building 4. In NWS, I work in Building 2. The sculpture above is in front of Building 3. I don’t blame you if you’re confused. The sculpture in front of NOAA’s SSMC3 building (at 1315 East-West Highway) on its Silver Spring, Maryland campus is called “The Hand of Noah”. It was given this title by its sculptor, Raymond Kaskey, in 1991, and symbolizes NOAA’s stewardship of the environment. In NOAA-land, the giant hand makes a convenient landmark. “Meet me at the giant hand,” is a phrase you hear a lot. I took this photo during a beautiful, short-lived snowstorm in Silver Spring. I’ve wanted to get this pic for years and, finally, the weather and my schedule cooperated. Like the birds in the sculpture, I feel free!